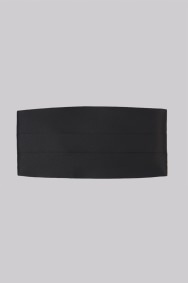 Be Instagram-ready with this sophisticated cummerbund from Moss 1851. As you’d expect from a statement accessory, it’s perfectly tailored to bring your black tie outfit together beautifully. By subtly smoothing over your waist it edits your belly and promotes a slim shape whether you’ve been hitting the gym or not. Match with your best bow tie and one of our design-led dress shirts, for the ultimate in high-rolling style. Perfect fit at a great price.. its a winner. Great quality items at moss and the service was amazing. Jordan made me feel a king and no pressure to buy. Shop on the high street save the best way of life. Ideal and adjusted to me, I am large. This again was alright, glad it fit. I hired a black tie - it looked great. A great item anta great price. Looks good - with good band. Was a sale item and good value for money. It kept falling off but maybe I should have asked how to put it on?